A lot has changed in the 20 years since the release of Independence Day in 1996. Massive leaps in technology, geopolitical conflicts, and social shifts have drastically altered our society in that time, but the real world changes are very different from those seen in the alternate timeline leading up to Independence Day: Resurgence. Picking up in real-time, ID:R portrays a much different recent history than our own alien invasion-free world. The alternate events that occur following the War of 1996 in Independence Day definitely depict a darker timeline. Thanks to a big viral marketing campaign, a prequel comic, a prequel novel - Independence Day: Crucible - and various Independence Day: Resurgence clips and trailers released during marketing, this dark timeline has become a little more clear. Forget the history you thought you knew, and prepare yourself for some spoilers. Here is the full alternate timeline leading to Independence Day: Resurgence. Most of the pre-1996 history in this universe aligns with the events we are familiar with in real world history, with one notable exception. The aliens had been conducting frequent scouting missions to Earth to examine our civilization and abduct humans for medical investigation prior to a full invasion. One such mission goes to New Mexico on July 4th, 1946, likely drawn in by signs of the nuclear testing that had been conducted there. During the mission, the orbiting carrier ship suddenly jumps away from Earth to avoid detection. Upon losing connection to the parent carrier, the scout ship crashes near Roswell, killing two of the three alien passengers. The United States military is quick to the site, taking the ship and the aliens to Area 51, where experiments are conducted on the surviving alien until it dies a few weeks later. Records of this incident and the studies conducted over the following years are kept strictly under wraps, existing even outside the President’s purview, for the next 50 years. Area 51 scientists attempt to repair the alien scout ship and continue experiments on the recovered alien bodies, continuing to gain an understanding of their biology. When they were recovered, their bodies were encased in a biomechanical exoskeleton, which gave them enhanced strength and durability. Once they were removed from their outer shell, scientists discovered the aliens weren’t all that unlike humans: they breathe air, have similar tolerances to temperature, and are just as vulnerable to injury. One major difference, however, is the absence of vocal chords. Unable to verify with any living aliens, scientists postulated that the aliens communicate via telepathy or ESP. While the alien bodies were not physically evolved beyond ours in any drastic ways (other than telepathy), the technology in the alien scout ship was a little more confusing. Without the presence of the carrier ship, and unable to discover the alien source of power, it was impossible to turn the ship on to perform technical tests. Nevertheless, the scientists continue to perform repairs, gaining what little knowledge they could from the process. 12 1996 - "The War of 1996"
On July 2nd, 1996, the aliens return in force. A mothership enters Earth’s orbit, deploying 36 city destroyers that spread out across the globe. Over the next 48 hours, these ships raze 108 cities, killing over 3 billion people. On July 4th, forces from across the world come together in response to a rallying call from United States president Thomas Whitmore (Bill Pullman), mounting one last stand against the extra-terrestrial forces. Thanks to the technical wizardry of David Levinson (Jeff Goldblum) and ace piloting skills of Captain Steven Hiller (Will Smith), the alien scout ship captured back in 1947 is used to sneak aboard the a mothership, implanting a computer virus and launching a nuclear missile, destroying the ship from the inside. Without the mother ship, the alien forces lost their shields and became disorganized, allowing the forces of a united Earth to overpower them and bring a decisive end to the 2 day war. In the aftermath of the mothership’s destruction, several alien craft crash around the world, with one touching down in the Atlantic Ocean. Captain Joshua Adams (William Fichtner) is dispatched to investigate, taking a submarine to the ocean floor. Upon arrival, Captain Adams discovers the aliens have landed on a major fault line, and are attempting to trigger a major earthquake. Such a disruption would result in massive tsunamis, annihilating any remaining traces of civilization in any coastal cities surrounding the Atlantic. Adams sets out to destroy the ship to prevent the attack. During the mission, US Marine forces are able to capture an alien prisoner, along with multiple alien weapons for investigation. Upon returning to the sub, the alien engages Adams in a psychic attack before being killed. The attack leaves lingering traces in Adams’s head, providing an innate understanding of alien technology and culture. Like other victims of alien mental attacks, Adams has to deal with this mental imprint for many years following the encounter. Humanity immediately begins to rebuild. With over half the world’s population decimated, along with most major cities, this is no small tasks. Cities like Washington DC and London are among the first to be rebuilt, while Las Vegas is left in ruins to stand as a monument to all that was lost during the war. Some cities were completely annihilated. Tokyo represents the site of the most casualties, as the alien attack killed every human in a 20 mile radius. Other cities are still standing, but left completely uninhabitable. In the case of Houston, radiation from an attempt to nuke a city destroyer would prevent the city from being re-inhabited after the war. Small pockets of surviving aliens form a resistance, holding out in remote areas such as the jungles of the Congo. These survivors manage to hold out for many years, with local governments denying international assistance in putting an end to the remaining alien force. Much of the 20th century prior to the invasion was marked by global conflict. 2 World Wars, 20 years of conflict in Vietnam, and an icy Cold War between the US and the Soviet Union that stretches into 1991. Real world history continues this trend with the War on Terrorism beginning in the early 2000s, but the War of 1996 - or the first alien war - causes a drastic difference in the timeline. Due to united efforts in fighting back the aliens, the countries of the world are able to put aside their differences and form the Earth Space Defense to prepare for the eventuality of another alien attack. The ESD takes on the tasks of recovering alien artifacts, developing new alien hybrid technology, and constructing new Earth and space defenses. With all the countries of the world focused on this singular objective, and access to advanced alien equipment, technology grows in leaps and bounds faster than any real life advances, propelling humanity forward by decades - if not centuries. At first, efforts to decipher the proper applications of recovered alien technology aren't met with much success. Earth’s comparatively primitive technology is not sufficient to gain a complete understanding of the how the alien artifacts function. Eventually the ESD’s scientists, including David Levinson, make a major breakthrough after discovering that the alien technology is not meant to be deconstructed, but to be expanded upon, like an open-source hardware platform or technological building blocks. This discovery allows the ESD to drive forward with new advancements, one of the first of which is to incorporate the alien tech into an F-22 Raptor, utilizing the aliens shielding capabilities for existing crafts. This breakthrough results in a first-of-its-kind alien hybrid fighter, opening the door for an entirely new era of human advancement. Accompanying the military advancements come consumer advancements to assist in the rebuilding efforts and improve the quality of life of the surviving population. Thomas Whitmore’s career as a politician comes to a close with the end of his second term as president. Before he went into public service, he was a pilot during the first (and only, in the timeline) Gulf War. His first term as President was marked by his struggles in passing legislation, causing the media to paint him as too inexperienced and incompetent, dropping his approval rating through the floor. This all changed after his demonstration of leadership during the War of 1996, rousing the forces of the entire world with his famous speech, telling those gatherd “we're fighting for our right to live, to exist,” ending with a rousing battle cry, yelling “We will not go quietly into the night! We will not vanish without a fight! We're going to live on, we're going to survive. Today we celebrate our Independence day!” Following the speech, he personally lead the air attack against an alien city destroyer, effectively ending the war. Even though the aliens were defeated over five years prior, pockets of alien forces remain in some of the more remote areas of the world. One such pocket exists in the newly founded National Republic of Umbutu (formerly Congo) in central Africa, where an intact alien craft touched down at the end of the war. Umbutu’s leader, Upanga Umbutu, repeatedly rejects ESD offers of assistance due to his distrust of foreigners, believing they mean to colonize Umbutu. William Grey’s tenure as president ends after his first term in office and he’s replaced by Lucas Jacobs. Jacobs is a former Senator, and also served as a Lieutenant General during the War of 1996. Now that the world is more united, Jacobs pushes for even more globalization, focusing heavily on international relations, and also serves as a staunch supporter of the Earth Space Defense initiative. Pushing the ESD to continue its progress in experimenting with alien technology, Jacobs oversees another tech boom due to ESD breakthroughs. During this time, stories start to surface suggesting Area 51 is harboring alien survivors in a subterranean prison under the base. This prison gives scientists opportunity to learn from the alien biology, due to their ability to experiment on live subjects. In this prison, it’s discovered that the aliens are actually fragile beings and depend on their exoskeletons simply to survive in Earth’s atmosphere. Colonel Steven Hiller (Will Smith) tragically dies while test piloting an alien hybrid fighter during the ESD’s spring expo. There were major questions as to the ship’s safety, but due to increased pressure from President Jacobs on ESD Director Strain to produce visible results from the experiments with alien technology, the test happens anyway. Knowing the risks of the test, Hiller refused to allow any other pilot to perform the flight, refusing to put pilots with less experience in danger. The death of the Colonel, a worldwide hero, causes a media nightmare for President Jacobs, who throws Director Strain under the bus. The loss of Hiller convinces David Levinson to step up, accepting a role as the new Director of the ESD, hoping he can prevent governmental negligence from sacrificing additional lives. Thomas Whitmore - who’s been struggling with the aftereffects of an alien psychic attack during the war - is decimated by the loss of Hiller, and withdraws from society, becoming a hermit. The ESD makes its next major leap forward, establishing multiple defensive satellites, and a base on the moon. These installations have three-fold purposes. The first is to monitor the entire solar system. The first alien attack wasn’t detected until the last second, and humanity doesn’t want to be surprised like that again. The second purpose is defensive. Equipped with multiple defensive measures, these installations are designed to stop, or at least slow, the advance of any future would-be invaders. The third function is offensive. Having studied the alien city destroyers, humanity is able to replicate the technology in the destroyers’ main weapon, making the installations some of the most powerful tools humanity possesses. Thanks to the partnership with China and the ESD to create the Moon Base and orbital defenses, Earth’s scientist have made unprecedented breakthroughs in the adaptation of alien technology, leveraging it for use in both military and consumer functions. Speaking at a TEDx conference, David Levinson highlights humanity’s technical accomplishments. Many of the achievements he mentions are recent real life advances, like capacitive touch screens and drones in addition to technology not yet seen, such as “warp-core” vacuum cleaners, which function similarly to a black hole, sucking dust bunnies (and stray Legos) into another dimension. At this point, the world has been almost completely transformed by the incorporation of alien technology. The fact that these breakthroughs are occurring in parallel with major rebuilding efforts meant that many major cities and their associated infrastructures have been reconsructed from the ground up with futuristic technology, fundamentally altering society. In 2013, Elizabeth Lanford (Sela Ward) replaces Lucas Jacobs as President of the United States, representing the first female to ever hold the office. Lanford previously served under President Jacobs as his Vice President (also representing the first woman to hold that office), showing that humanity's advancements haven't been solely technological. Lanford is a decisive leader who continues to push for improvement in the world’s technology and defensive capabilities. Even though there’s been no sign of the aliens for nearly two decades, Lanford wants to be ready for any future threat. At this point in history, the United States - and most of the rest of the world - has maintained a near singular focus on preparing for another alien invasion, a focus that is beginning to come at the expense of non technical or military objectives. While most people think the world is more than ready to handle another invasion, people were traumatized by the initial attack, and that fear still permeates most people’s decision making, especially on a governmental level. After years of using alien technology to enhance existing fighter jets, the ESD unveils the first full hybrid alien fighter, the H-8 Global Defender. 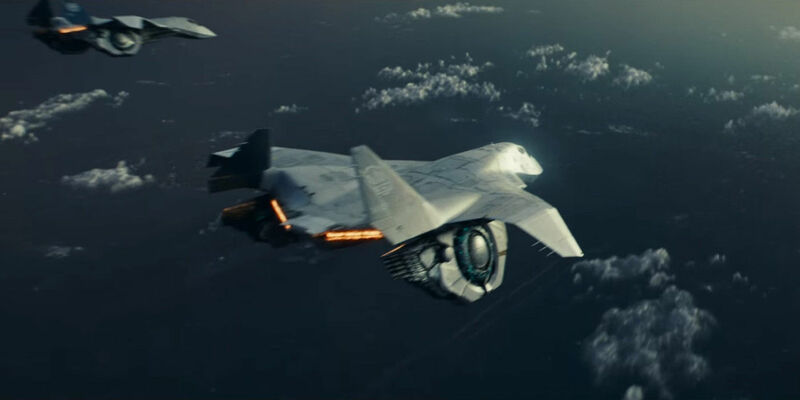 Unlike the previous advancements to the F-22 Raptor - which merely integrated alien shield technology into the fighter’s hull - the H-8 fully takes advantage of a more complete understanding of the alien tech by building in anti-gravity generators, along with other enhancements. These improvements make the H-8 one of the fastest and most maneuverable vehicles ever created in the history of humanity. The incorporation of alien laser rifle technology also means the fighter is packing a punch. These ships are flown by elite ESD pilots, including the stepson of Colonel Steven Hiller, Captain Dylan Dubrow-Hiller (Jessie T. Usher). In addition to the H-8, the ESD has also developed several other vehicles, including the Space Tug, which is used to haul cargo to and from the Moon Base by ESD mechanics such as Jake Morrison (Liam Hemsworth). The Space Tug and other hybrid vehicles utilize an advanced “warp drive” propulsion system that allows them to make short work out of the 238,900 mile trip to the moon. Celebrating the 20th anniversary since the victory over the alien invaders, Earth comes together to celebrate the heroes of the War of 1996. President Lanford gives a tribute speech, and unveils a painting of the 42nd President and war hero Thomas Whitmore, whose leadership is still recognized as a galvanizing force in turning the tide back against the aliens. Thomas Whitmore himself has been removed from the world since the death of Stephen Hiller. His encounter with the aliens left a mental imprint, as is the case with many others that have had alien encounters, including General Joshua Adams and Dr. Brackish Okun (who’s been in a coma since his encounter in 1996). Whitmore feels the presence of the aliens in his head, and suspects they’re going to return to Earth. These visions are common amongst other victims of alien mind control, all of whom also have a shared visions of alien symbols, particularly a circle with a line drawn through it. Their premonition of an impending alien return are confirmed when the last of the alien resistance in the National Republic of Umbutu are able to send a distress signal into space, calling for the aid of the main, much larger, alien invasion force. Independence Day: Resurgence opens in U.S. theaters on June 24th, 2016.